- 10% discount until 31 March 2018. - 7=6, 14=12, 21=18 for periods of stay: 20 May - 12 June 2018; 11 Sept - 30 Sept 2018. - 9=8 for the period of stay: 20 May - 10 June 2018. * Extras can not be combined with early bookings. 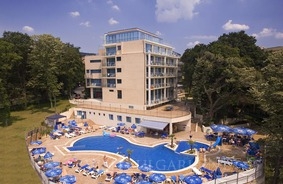 Location: Holiday Park hotel is situated in a park, 300 m from the beach in the southwest part of Golden Sands resort. The hotel is only a short walking distance from the resort center, 200 m from the bus stop. Accommodation: The hotel features 5 stories, 145 fully-equipped rooms,including 109 double rooms and 36 studios with own bathroom, air-conditioning, TV set with many satellite channels, direct dial telephone, balcony, small refrigerator and hair dryer. The studios offer the same features as the double rooms including a kitchenette and extra two pull-out armchairs. Bars and restaurants: The hotel offers lobby bar, main restaurant with terrace, BBQ restaurant, Snack & Pool bar and Coffee – bar. Facilities and services: 24-Hour Front Desk, individual Safety Deposit Boxes, Newspapers, Garden, Non-Smoking Rooms, Elevator, Luggage Storage, Airconditioning. Room Service, Laundry, Barber/Beauty Shop, Ironing Service, Currency Exchange, Fax/Photocopying. Wireless internet is available in public areas and it is free of charge. Parking can be used for extra charge.